It’s hard to find a place in Italy these days that isn’t overrun with American tourists. Bergamo was the first quaint town in Italy that seemed truly local and wonderfully peaceful. Bergamo is located about an hour northeast of Milan, in the Italian region of Lombardy. It’s near the foothills of the Orobi Alps and popular with Italian skiers looking for adventure. The city itself is so unique that I felt a little like Indiana Jones discovering the lost arts. The city dates back to 49 BC and is really two cities on top of one another. 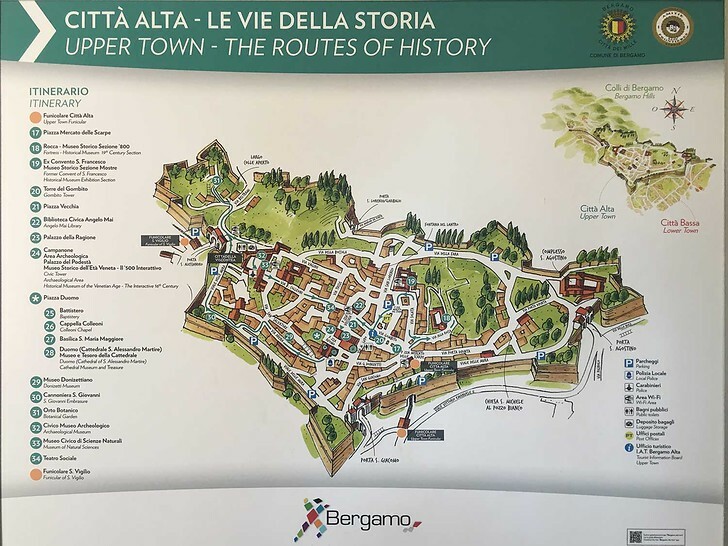 There’s the Citta Alta or Upper City and the Citta Bassa or Lower City – each connected by funiculars and walking trails. 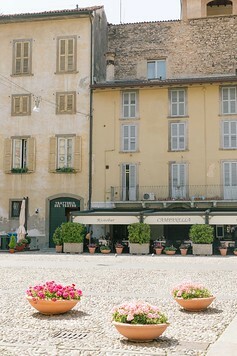 Keep reading for how we spent one charming day in Bergamo, Italy. Bergamo is located in Italy’s Lombardy region where the closest airport is Orio al Serio. Just set a flight alert for your trip dates! Already in Italy? 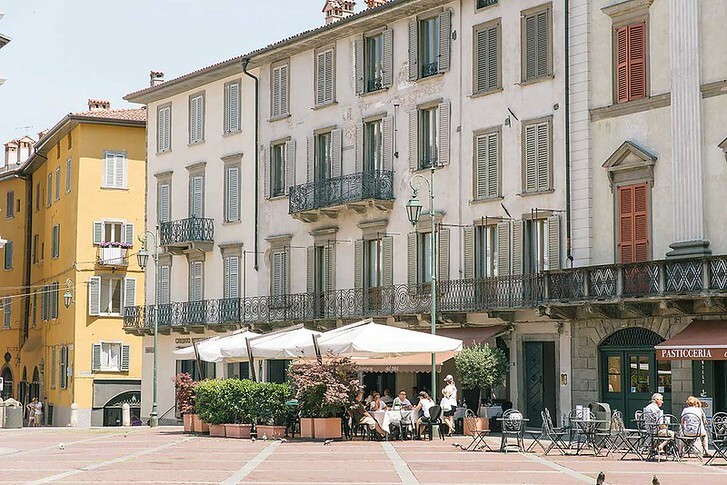 Bergamo is close to Milan and can easily be seen in a day trip, via high speed train. Check train schedules online here, and buy your tickets in advance in order to save. The journey takes just under an hour. 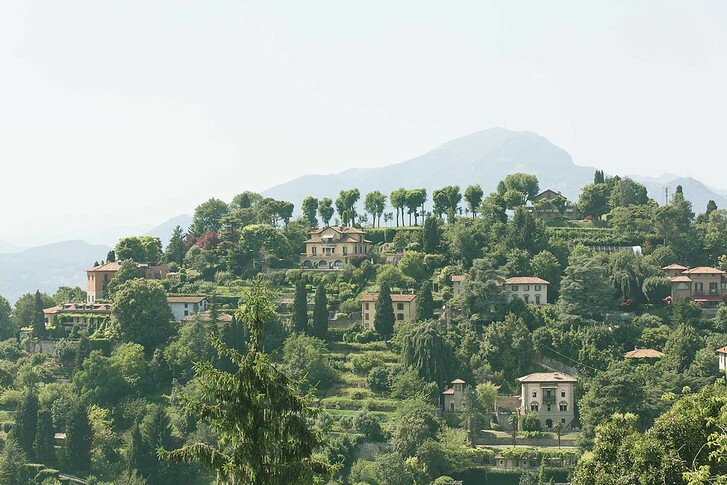 When you arrive, you’ll be in Bergamo’s modern day town. We wanted to see the quaint Old Town, so we caught the local bus which took us to the funicular. 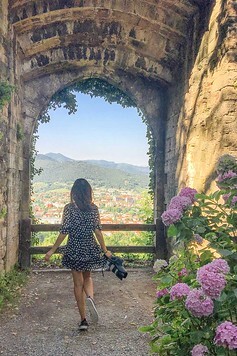 We mainly spent our trip in Bergamo’s medieval Upper Town, which was a delightful maze of cobblestone streets, old architecture and historic monuments. High above the city with views over the alps, Bergamo’s Upper Level is a picturesque medieval town known for its ancient art, local cuisine and medieval architecture. For a quaint experience, stay in Città Alta. Here you have old winding streets, excellent city views and above all, an incredibly unique experience. 1 | Relais San Lorenzo – This modern 5 star hotel has 30 elegant rooms, an on site restaurant and spa. It’s one of the most classic hotel choices in the city and its lounge bar is perfect for cocktails and sunset dinners, as it has a view of the town center and Alps! 2 | Gombit Hotel – A new hotel in Bergamo, the 13 room Gombit Hotel has modern rooms that contrast prettily with its medieval location next to a 13th century tower. Rooms are reasonable and come with breakfast. 3 | Hotel Exclesior San Marco – For a more affordable choice, San Marco has beautiful old fashioned rooms and suites that face the peaceful square Piazza della Republica. 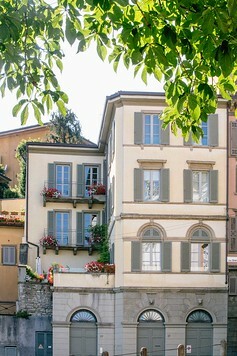 The hotel is located in Bergamo’s Lower Town but conveniently next to the funicular which takes you up. Bergamo’s Upper Town is one of the most unusual places I’ve ever visited in Italy. Located on a hilly mountain with stunning views of the Alps and lower city, the Citta Alta has spacious plazas, cobblestone alleys and impressive churches from an earlier era. This is a walking city, so pack a great pair of your best sightseeing shoes and grab a map! Bergamo’s two city centers have been connected via cable car for over 120 years. 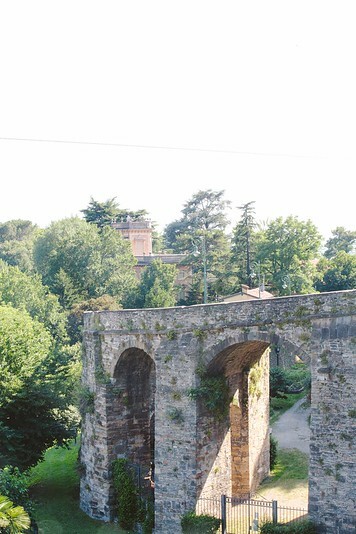 Two quaint orange coaches slowly ascend and descend each day past the city’s ancient Venetian walls, green gardens and scenic valley. If you’re arriving into town, take the local bus to Viale Vittorio Emanuele and ride straight up. The funicular takes just a couple of minutes and climbs 85 meters high along 240 meters of distance. Impressive! It drops you off in Piazza Mercato delle Scarpe, a square named after the shoes market which once thrived here in 1430. From the square, you can explore the Upper Town on foot. 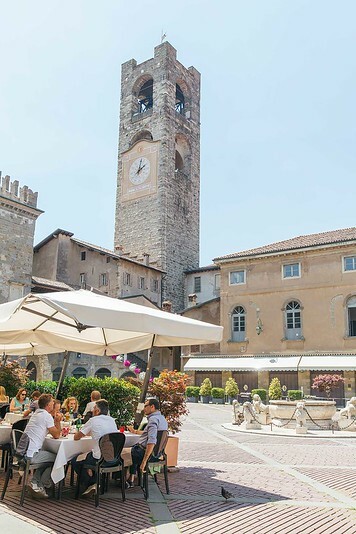 Bergamo is a pedestrian walking town with tiny winding streets that suddenly open on beautiful, expansive plazas. 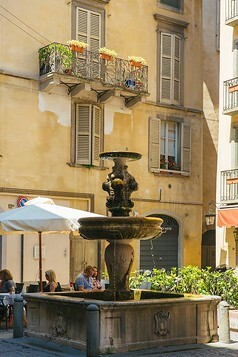 Of all the public squares, Piazza Vecchia is the most famous because it is the seat of government and near two famous churches. Each building that lines the plaza is built in a different architectural style – from the Fontana Contarini to the Civic Tower which was built in the Middle Ages. You can climb up the tower for an amazing view of the square. There’s also a great restaurant on the square if you want a classy dinner with a side of people watching! This is the most beautiful building in Bergamo! Turn the corner off Piazza Vecchia and marvel at this red and white marble facade, built in the Italian Renaissance style. The chapel was built for Bartolomeo Colleoni, a famous mercenary soldier who spent his life fighting for the Republic of Venice. 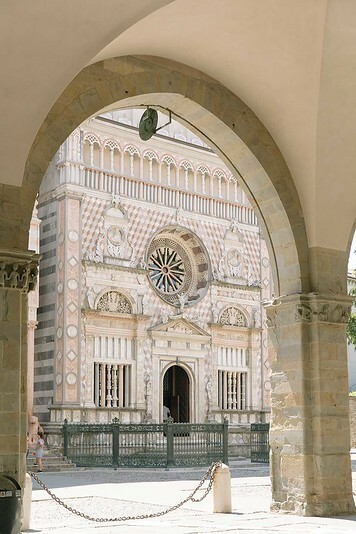 Colleoni was born in Bergamo and returned to his home town at the height of his power, building this ornate chapel where he was ultimately laid to rest. Inside, photos aren’t allowed but you’ll find the family sarcophagus, ornate sculptures and Italian frescoes. A superstition says that if you rub the Venetian coat of arms at midnight, you’ll get good luck. Next door is the Church of Santa Maria Maggiore. In the 1100s, a plague had destroyed much of Europe. Bergamo’s residents asked the Virgin Mary to protect them and vowed to create a church for her if they survived intact. As a result, by 1137 they built this beautiful Basilica on the corner of Piazza del Duomo, over an ancient Roman temple. The outer facade is made of a clean white marble while on the inside, the decorations are ornate. Famous Renaissance artist Lorenzo Lotto designed the lavish frescoes, stucco, tapestries and wooden marquetry that decorate the interior. If you’re up to it, keep climbing and check out the Rocca di Bergamo, or ancient fortress. 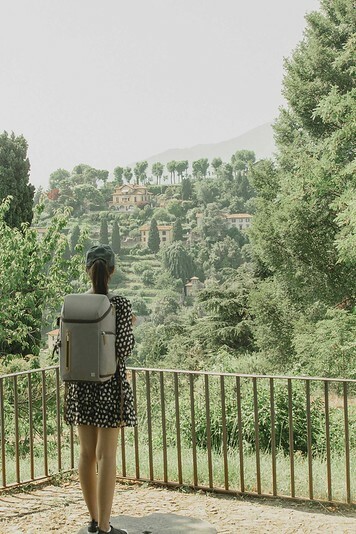 It’s a beautiful, peaceful roof over the city perfect for a leisurely afternoon nap or epic view of the Italian hills – on clear days you can see all the way to Milan! Nearby there’s also a pretty garden with a charming lake, willowy cypress trees and old cannons. On the day we visited we saw lots of local Italians having picnics, reading books and enjoying the breeze. For over 400 years, Bergamo was part of the Republic of Venice and the Venetians built these magnificent stone walls to guard the Citta Alta. The stone walls are over 6km in length, completely enclosing the ancient city center and today are a UNESCO World Heritage site. Luckily, the walls never underwent a siege and remain intact today. A great way to catch the sunset is to take a leisurely walk around the antique walls. You can also book a tour to visit the underground tunnels beneath the walls! 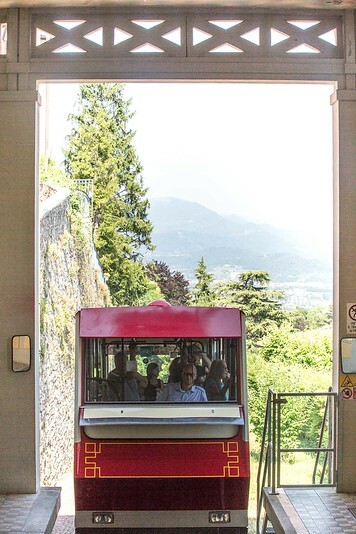 There are several main gates to enter the ramparts: San Giacomo gate is a pedestrians gate while Porta Sant’Alessandro is where you can catch the Funicolare. 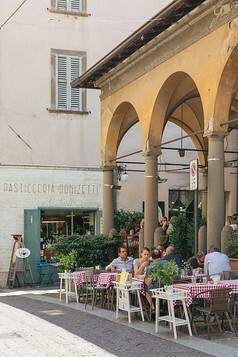 Bergamo remains off the well trodden American tourist trail and as a result, most of the restaurants cater to locals. 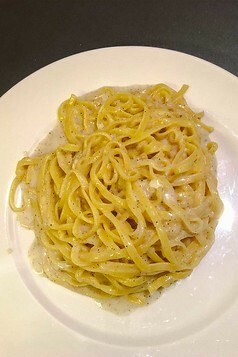 pizzoccheri: a buckwheat pasta typically served with greens, fontina + Parmesan cheeses, potatoes and sage. Don’t skip out on either of these Bergamo specialties! They were SO good! From what we saw, Bergamo was not really a popular city for tourists to visit in Northern Italy. I think it’s because the town is not mentioned in Rick Steves book and is not large enough for tour buses and mass groups. If you’re looking for a relatively undiscovered side of Italy, this charming medieval town in Lombardy is a great choice! We really loved the unique architecture and it’s certainly one of the more quaint small towns in Italy. Best of all, it’s pretty straight forward to get to! 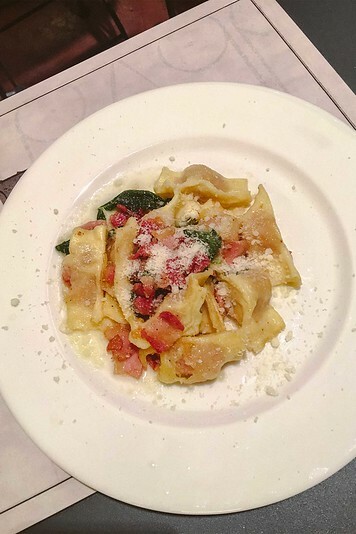 Let us know in the comments if you’re headed to Bergamo or have other hidden gems in Italy to recommend! © 2019 Sher She Goes|ProPhoto Photo Website by NetRivet, Inc.